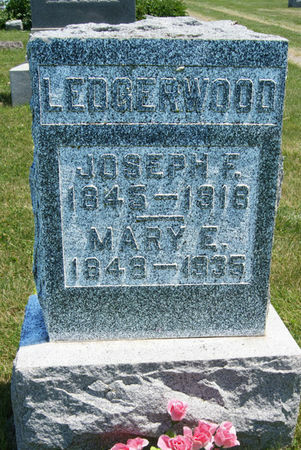 Joseph Franklin Ledgerwood, Sr., son of John Lemon Ledgerwood and Charity Whiteneck, was born Aug. 8,1845 in Sullivan Co., Indiana and died Dec. 22, 1918 in Blockton, Taylor Co., Iowa. He married Mary Elizabeth Miller Jan. 1, 1871 in Taylor Co., Iowa. She was born May 1, 1848 near Bedford, Taylor Co., Iowa, daughter of Henry Miller and Elizabeth Martha Lowe, and died Mar. 3, 1935 in Blockton, Taylor Co., Iowa. Searching for MARY ELIZABETH MILLER LEDGERWOOD in Taylor County Iowa?